Ultraviolet (UV) Water Treatment Purification Systems are primarily designed to treat a private water supply such as water tanks for canal boats or ships, boreholes, wells river water or any water source where biological hazards such as bacteria, viruses, cysts and other micro-organisms are a potential problem. UV waterdisinfection systems are also highly recommended for the elimination of Legionella, which is resistant to chlorine, from mains tap water. Ultraviolet (UV) water treatment works by exposing microorganisms to UV radiation from a specialist Ultra Violet light bulb, which destroys the DNA and disables the ability of micro organisms to replicate. Ultra Violet (UV) water treatment systems are arguably the best and most reliable way to kill bacteria, viruses and other micro-organisms that can be found in water because they do not use any chemicals or create any by-products. They are safe, reliable and highly economical and can be combined with a whole house water filter system to give total protection and perfect water. There are a number of factors that can degrade the effectiveness of an ultra violet water treatment system and should be taken in to consideration when installing on your private water supply. The first is that the water needs to be free from sediment as suspended solids can block the UV Rays from passing through the water effectively, allowing germs to 'hide' from the UV light. For this reason it is strongly recomended that one or more sediment pre-filters be installed at the same time as the UV steriliser system. Another potential issue can occur where ther is high dissolved iron and/or manganese in the water as this may gradually coat the glass with residue preventing the full amount of light from penetrating the water. In this case the water would need treatment with an iron & manganese filter system prior to the UV sterilisation. Regular inspection of the bulb is recommended and they should be replaced after they have reached the recommended service life; even though they may still appear to be working they may not then be emitting the necessary wavelength to ensure complete protection. Below we have a range of UV Ultraviolet Water Filter Systems, the main difference between them being the flow-rate. To ensure that you purchase the correct ultra violet water treatment system for your home please refer to our guide 'Calculate Your Flow Rate'; if in doubt always go for the next higher capacity model. If you need help choosing the correct ultra violet water sterilsation system for your UK private water supply simply call us on 0203 -507-1879 or email info@puriflowfilters.co.uk. 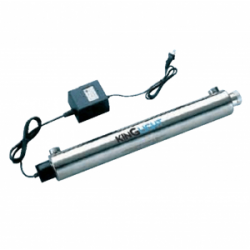 KingLight 23 LPM (6GPM) UV Steriliser System 32w The KingLight UV system is..
KingLight 45 LPM (12GPM) UV Steriliser System 39w The KingLight UV sy..
KingLight 8 LPM (2GPM) UV Steriliser System 14w The KingLight UV system..
Lightbest UV12 (45 LPM - 12GPM) UV Steriliser System 55w The Lightbest UV system is an affo..